Gelson’s is a chain of upscale supermarkets in Southern California, specializing in fresh foods and upscale tastes. Imagine a more mature and dignified Whole Foods, but geared towards 50-somethings rather than 30-somethings. The Gelson’s deli section is home to perhaps my favorite salad dish on earth, but they have an enormous selection of Boar’s Head meats and cheeses, standing at the ready for patrons to select either by the pound, or to build their own sandwich, selecting from a smaller selection of breads and accents. For those less finicky, the deli section also offers three to four “ready-made” sandwiches for a smaller fee; meat, lettuce and tomato on bread, to which they will add your choice of condiments and cheese before wrapping the enterprise up for you. I selected the honey roasted turkey on ciabatta, to which I added baby Swiss and what Gelson’s had listed as “Dijon” mustard. This latter proved to be the downfall of both myself and the sandwich. As most sandwich practitioners and enthusiasts can attest, Boar’s Head makes quality, consumer-grade meats and cheeses, and the honey roasted turkey and baby Swiss were both outstanding. Shockingly, it was the mustard that ruined this sandwich – something I was previously unaware with anything short of the foul yellow paint that emerges from a squeeze bottle. The Gelson’s “Dijon” was actually coarse stone-ground mustard with intense heat, and applied with a decidedly uneven hand. It completely overwhelmed the subtle and delicate meat and cheese. What’s more it separated from the rest of the sandwich. Every other bite would be chock-a-block full of the mustard, which would land straight on my tongue, burning, as I chewed the rest of the sandwich around it. Amazingly, this was a sandwich that would have benefitted from mayo, no mustard. Let this serve as a reminder to fans of mustard that, foremost, there is such a thing as “too much,” and secondly, to pair your mustard carefully with the main ingredients, lest they be lost in the shuffle. 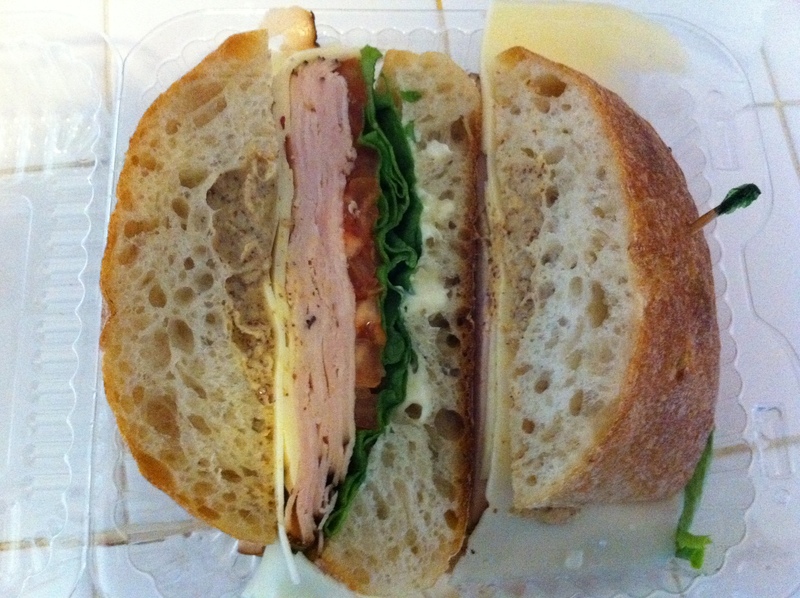 This entry was posted in Sandwich Reviews and tagged Deli, Mustard, Turkey by bengrimm. Bookmark the permalink. Well color me shocked. Having been with you to Phillipe’s, I know that you’re a man who can enjoy a spicy mustard. Was this just the wrong carriage for such a condiment, or was it just an absurdly spicy mustard? Phillipe’s mustard is smooth, and I can evenly distribute it. The bread at Phillipe’s married well with the mustard, and the meat is neither tough nor delicate. Here, the bread made for poor distribution of an already poorly-applied spread of mustard, and the texture of both elements both overwhelmed and did not complement the other, more delicate “stars” of the sandwich.